I love the color yellow in the garden. Yellow is the color of happiness and sun. 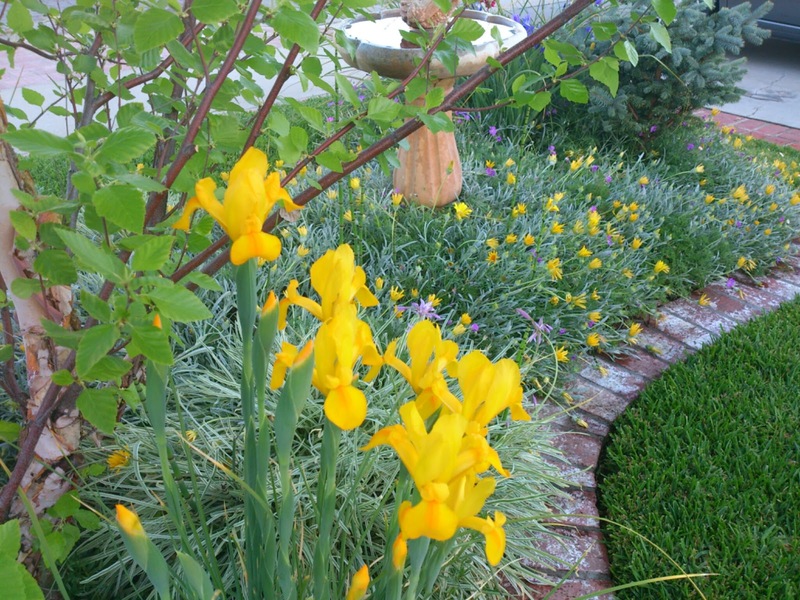 My yellow iris are just exploding in our garden. I love yellow. The yard is exploding in it. And because spring means bees buzzing in all those flowers, I brought out some appropriate decor after tucking away the Easter goodies. So so pretty. I've always loved your bee skep and have kept my eyes open for one just like it but I've never seen one. Enjoy this beautiful weather. I love nasturiums. I need some yellow and green outside. No more white! Look at all that yellow - it's glorious! I can't wait to get my planting going, hoping for warm weather soon, we had sleet last night! How nice and bright, and cheery. Me...I like just a touch in the garden, it makes everything pop. This post was like a breath of fresh air! Lovely! You ARE in the yellow!! Lovely!! All your yellow flowers are so pretty! Love the bee skep! Your flowers are absolutely beautiful! Thanks for sharing. merci pour le partage de ces merveilleuses photos qui apportent une belle note d'optimisme dans ce printemps qui reste timidement encore en arrière! gros bisous à vous et bonne fin de semaine. Yellow is such a happy color - gotta LOVE it. My yard is melting right now no color to be seen but white. Wow, Elaine, your yard is absolutely beautiful! I love Yellow too! Have a fabulous weekend. Love the beautiful colors and flowers. I tried nasturtiums last year and had no luck at all. I grew everything in Iowa but here....nada. Love the bee skep too. I've always wanted one. One of these days maybe. Your bee vignette is darling! 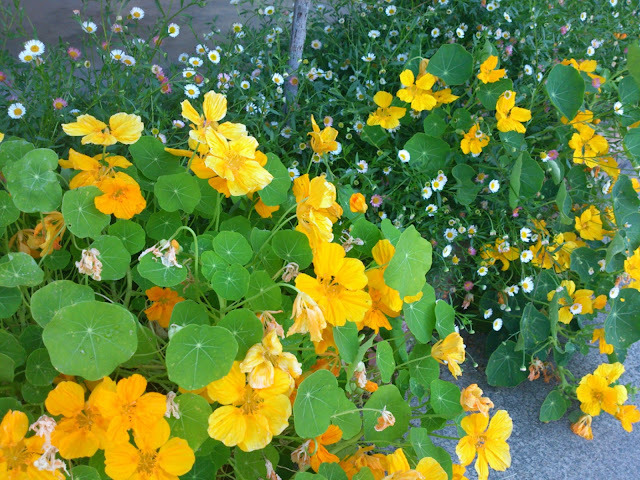 I always enjoy seeing your nasturtiums. Love the yellows. So pretty. I really like the purple and yellow flowers together. Elaine are you using your phone to take pictures? These pictures are amazing! Beautiful! Sunshine yellow everywhere! Welcome Spring! LOVE LOVE LOVE all the yellow..so spring-y!! I love early spring when the flowers just start to bloom and everything is so full and pretty and full of life!! It's the beauty we enjoy to get us through the horrible summers here! HA! Hope you're having a wonderful weekend..thanks for sharing your pretties with us! I love your bee hive thingy,....so cute. 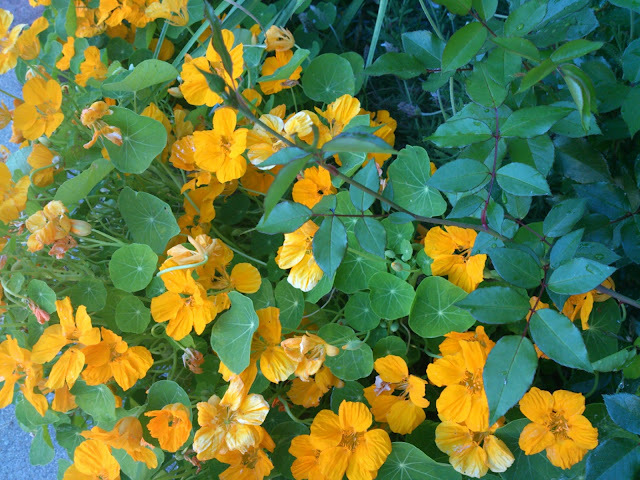 Your yellow flowers are so beautiful! I can't wait to have flowers outside once again. Hurry, warm weather! Yellow is one of those impossible not to smile colors! Such prettiness in your garden, Elaine. Love the bee skep, too! The pops of yellow in your garden are gorgeous! It all looks so sunny and happy. Such a sunny, happy post! And, that last pic of your bee skep is especially glorious. LOVE. Your photos are so sunny and stunning! Found you on A Favorite Thing and I'd love to have you stop by and share your post on The Creative HomeAcre Hop today! So pretty, love yellow in the garden! hi there... i found you through a favorite thing... you have such pretty flowers... i finally have some crocus popping up and some miniature daffodils... it's been a long cold winter in ne ohio... i was so thankful to spot that little bit of color popping up in our yard today! Pretty flowers, Elaine! Can't wait until my flowers start blooming here too. Love the bee hive-very cute. What lovely yellow flowers you have, Elaine! and I love that bee skep in your arrangment... it's perfect for Spring.